A new study says the ritual and physicality of direct mail could make it more impactful than digital marketing. While digital forms of advertising might offer more immediate and targeted access to consumers, physical direct mail marketing still has a role in driving engagement and action in consumers, according to new research. The “Breaking Through the Noise” report, commissioned by Canada Post and conducted by research consultancy Phase 5, took a qualitative approach, doing an ethnographic examination of how a group of participants sort through physical mail, email and direct marketing on Facebook, with a primary focus on promotional messages. This was done with a small camera that tracked the participant’s eye movements. Subjects then participated in two-week online forums where they submitted diary entries on their attitudes to direct marketing materials. Directly-addressed mail tends to be read first, with promotional mail being filtered out based on interest. Among the participants, 81% read their mail the same day they receive it. Responses from participants also indicated that brands become part of the mail ritual, and the emotions associated with it, by doing direct mail. On the other hand, email and social media messages are checked repeatedly throughout the day, with less of a regular routine around them, and can are done for reasons ranging from receiving a notification to simply being bored. Twice as many participants said they enjoyed receiving direct mail marketing more than digital forms of marketing. Direct mail has more of an impact, with 53% of participants saying they notice and read direct mail, compared to 26% who said the same of email. Reasons given by participants for this included liking the physical nature of it and the act of collecting the mail means having to sort and decide what to keep, making it more memorable. Also, people are receiving less physical mail as a whole, and participants mentioned that anything they do receive is more easily noticed, and that direct marketing stands out because of its visuals, where email is based solely on the subject line and easily skimmed over before it is ever opened. While email marketing tends to be kept private in the recipient’s inbox, participants in the research kept physical mail and put it on display in areas of the home for later use. Restaurant menus and coupons are left in the kitchen, with flyers and catalogues most often kept in living rooms for when it comes to time to plan shopping trips. Direct mail is also kept anywhere from a few days to over a month, depending on the format, as seen in the chart below. Physical mail also drove in-store traffic and purchases more than digital methods across most formats, according to the research. Physical flyers from grocery stores drove 45% of participants to the store (compared to 14% for digital flyers) and 39% when it came from other retailers (12% for digital). Physical coupons drove 31% of participants to fast-food restaurants (16% for digital coupons). 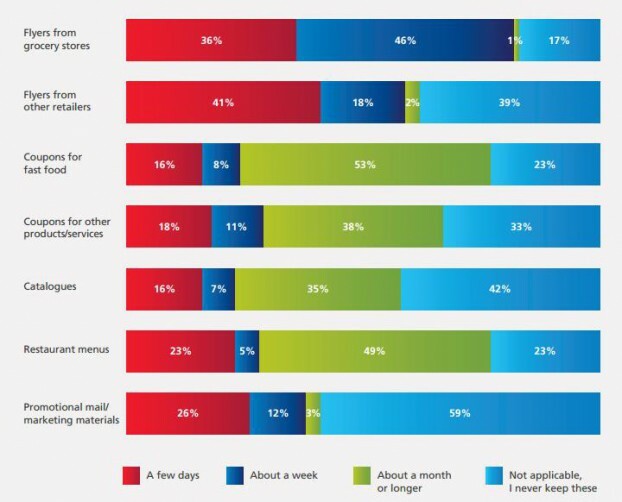 Physical catalogues drove 14% to stores (4% for digital catalogues). In terms of purchases, flyers drove 61% of participants to make an in-store purchase at a grocery store (compared to 23% for digital) and 31% at other retailers (12% for digital). Fast-food coupons drove 30% of participants to make purchases (8% for digital). And catalogues drove 16% of purchases (3% for digital). In both cases, the only area where digital out-performed physical mail was general promotional mail from retailers, which drove 24% of participants in-store (compared to 23% for physical) and 18% to make a purchase (16% for physical).